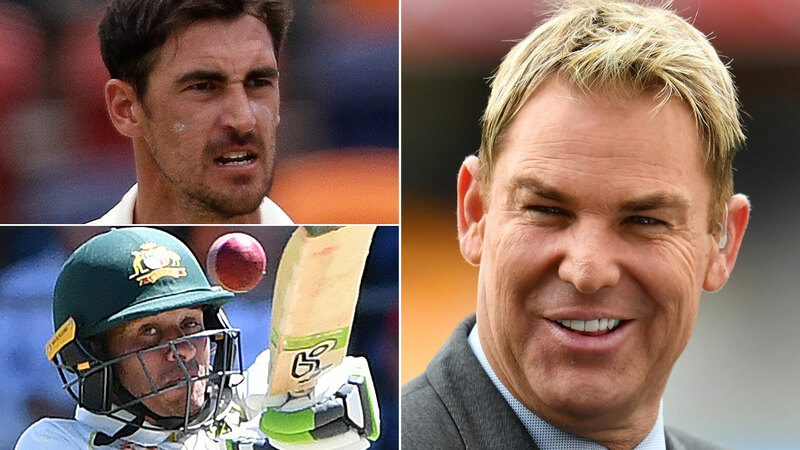 Shane Warne has called for Usman Khawaja and Mitchell Starc to be dropped for the first Ashes Test. Khawaja was left out despite making a century in his last innings against Sri Lanka, while Marnus Labuschagne and Kurtis Patterson also make way in Warne's team, which he named in his Herald Sun column. With David Warner and Steve Smith back, Warne named Joe Burns to open and either Marcus Harris or Cameron Bancroft to bat No.3. He left out Patterson to debut all-rounder Marcus Stoinis at No.6, while Starc was omitted for Jhye Richardson despite the left-armer's 10-wicket haul in his last Test against Sri Lanka. "The first few overs have to set the tone, and he’s not doing that. He’s been taken off after two or three overs every innings because he’s been spraying the ball all over the place, plus he averages over 50 with the ball against top six batsmen," Warne wrote of Starc. Of Khawaja, Warne wrote: "He has played a lot of Test cricket now, and he was our most experienced batsman this summer, we really needed him, and he went missing. Everyone is going to fail some times, and go through a lull, but it was the way he got out at times which was a huge concern. He tours England, but as backup." Warne also wrote that BBL star D'Arcy Short should make the touring squad, with his left-arm wrist spin a backup to Nathan Lyon, on top of his powerful hitting.